Most of the time I try to be mindful of what I eat. I try not to indulge in too rich or sweet of foods, but occasionally I can’t help it. I, like Superman, have my very own kind of kryptonite that I am absolutely no match for. Like a siren, it lures me in and makes me weak in the knees. There is no use fighting it, as I will never win that battle. What is it you ask? Macaroni and cheese. 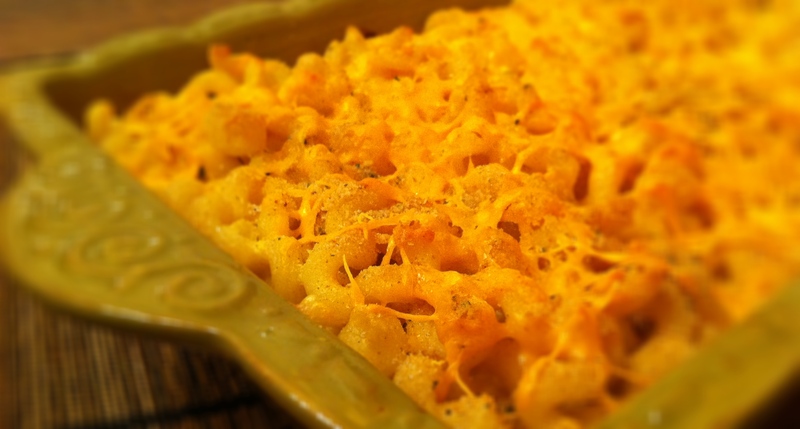 Mmmmmmm…..
To me, it’s the ultimate comfort food, a fan favorite, a guilty pleasure. I can’t think of a single soul that doesn’t enjoy it. A lot of recipes call for numerous types of cheeses but in my opinion its overkill. For me it’s all about the cheddar, sharp cheddar to be specific. Not only do I only use one type of cheese in my very special recipe but I also have a secret spice that I add, a spice that really pushes this dish over the top with flavor…. yellow curry powder….. (gasp). 🙂 Try it, I dare you, you will not be able to resist that second helping. Spread the rest of the cheese on the top of the pasta then top with bread crumbs. YAY! I’m glad you liked it so much, hope the fam does too! Hey Cant wait to try this recipe! Been trying to find a yummy mac and cheese!! We used your recipe for Thanksgiving this year…I’m not exaggerating when I say it was the hit of the dinner. One guest even begged us to take the (very tiny portion of) leftovers home. We didn’t have fresh nutmeg and omitted the eggs, but otherwise stayed true to your recipe. Thanks so much!